This is a fantastic read, with strong arguments and practical advice and guidance on how to increase your capacity for deep work, in order to lead a more productive and fulfilling life. A state of deep work is attained when your cognitive capabilities are pushed to their limits while concentrating without distraction. The premise is that distractions posed by open offices, social media, emails etc result in our precious time being predominantly filled by shallow work instead. 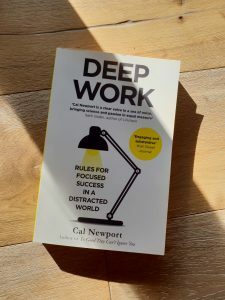 He states that to make deep work a habit, you must commit to rituals and routines that help enable it, and steer you away from easy distractions.